We all know the ultimate boy band was The Beatles but after the Fab Four, the 90s were the time when boy bands really came into their own. If you were a young lad in the 90s and were capable of standing up from a stool as the key changed in a song and were able to spread you arms out wide, you were a prime candidate to become a member of a boy band in the 90s. You would also have to be comfortable with wearing ridiculous outfits and sporting seriously questionable hairstyles. Having a decent singing voice was (apparently) optional. But back then, we didn’t care, we loved these boy bands in all their colourful, coordinated glory. Join us to revisit our favourites. Dreamy, with something for everyone, the Backstreet Boys were one of the most successful boy bands ever. BSB have sold over 130 million records worldwide and even have their own star on the Hollywood Walk of Fame. Did you know Nick, Brian, Kevin, AJ and Howie released a behind-the-scenes documentary called Show ‘Em What You’re Made Of in 2015? Me neither! I know what I’m watching this weekend! Mark, Robbie, Gary, Jason and Howard were huge in the 90s. Hysteria set in in 1995 when Robbie Williams announced he was leaving and the band decided to disband. There was even a hotline set up to comfort distraught fans. They reunited as a four-piece in 2005 and have since won several awards, including an Ivor Novello Award for Outstanding Contribution to British Music. I Want You Back was a worldwide hit for *NSync in the 90s, cementing them as the next big thing in the boy band world. Add to this Justin Timberlake’s blossoming love affair with Britney Spears and they were headline gold. However, they really came into their own in the year 2000 with their seminal album No Strings Attached. Since then, lead singer Justin Timberlake has gone onto to find huge solo success and bandmate Lance Bass (almost) went to space! Undoubtedly the smoothest of all the boy bands, Boyz II Men were known for their impressive a capella harmonies – and their awesome matching outfits. They hold one of the top records for most time spent at number 1 in the Billboard charts with 50 weeks in the top spot. They’re still performing as a three-piece so look out for a show near you and relive classics like End of the Road and One Sweet Day all over again! Sold as the edgier boy band in town, Five consisted of Scott, Abz, Richie, J and Sean. Hits like Keep On Moving, Slam Dunk da Funk and Everybody Get Up quickly positioned them as 90s boyband favourites. However, the dream was short-lived and the band split in 2001. After member Sean Conlon applied for The Voice UK and awkwardly didn’t make it past the audition stages, the boys reunited as a four-piece (though were still known as Five) and appeared on documentary series The Big Reunion in 2013 which was followed by successful tours with other 90s acts. Image: 8 tracks. 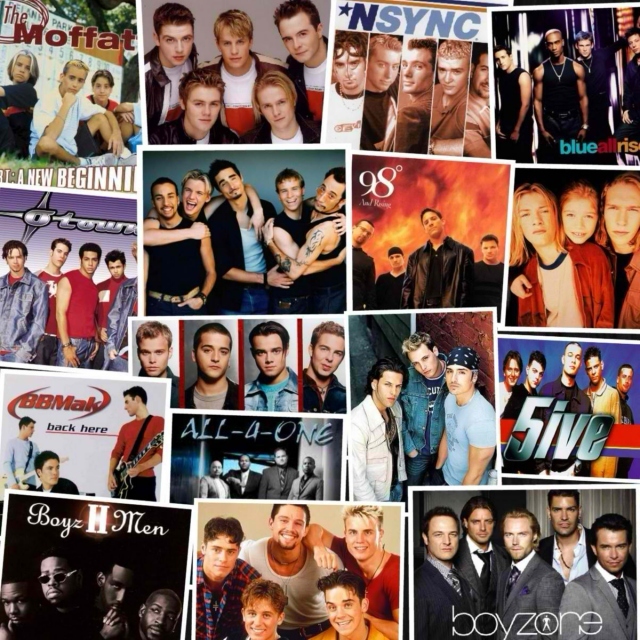 Video: Take That Vevo, Backstreet Boys Vevo, Nsync Vevo, BoyzIIMen Vevo and Five VEVO. Copyright statement.